Rebound Arena employs a safety policy designed to put you first and keep the fun going! All of our court attendants have been through our specially developed training program designed to mitigate the risk of injury to yourself and to others. We can never fully remove the danger from these types of activities and we rely on you to help us keep you safe. We’ve worked hard to design our park to meet and in some cases exceed International Standards. Rebound Arena, as Members of the ATPA are proud of our design and safety layout. We use state of the art Gymnastics grade materials to provide you with the best possible protection around, all of which is manufactured locally or in other parts of Australia, because we believe it’s important to keep Australians working. PLEASE READ AND UNDERSTAND THE RULES. These are here to help you enjoy our facility in the safest manner for everyone. It is important for you to jump within your limits. We understand in order to accomplish a goal you sometimes have to push the limits of what you can do, we just ask that you do it in the safest manner possible, by trying things into our airbag before you try it on a trampoline. From time to time it may be necessary for our staff to intervene if they believe an activity you are about to try places you in danger or someone around you in danger. Please pay attention to their direction, their say is final. Our staff do not provide skill-specific advice during free bounce sessions, however, we would be more than happy to direct you into one of our trampolining programs. Our staff are here to enforce our rules in a courteous manner and provide you with a first-class venue. If you have any complaints about our staff, or there is an area you feel needs attention please direct your concerns to the venue management. Participation in jumping could result in injury or death. Children must be at least 3-years of age to use the trampolines at Rebound Arena with a paying adult. Children less than 12 years of age must be supervised by a responsible person over 16. Where you are responsible for such children you agree to be bound by these conditions on their behalf and you will directly supervise them at all times. Maximum weight is 120kg for patrons to jump on the trampolines. Patrons have a duty to not participate in or on any trampoline court if they have pre-existing medical conditions, including but not limited to circulatory conditions, heart or lung conditions, recent surgeries, back or neck conditions, high blood pressure, any history of spine, musculoskeletal or head injury, or may be pregnant. We do not recommend using the trampolines if you are pregnant or think you may be pregnant. If you have a medical condition or are taking medication which would affect your ability to jump safely, please speak to a staff member before jumping. Patrons must not be under the influence of drugs or alcohol. If deemed by staff that a patron is under influence of either drugs or alcohol that patron will not be allowed to the enter jumping arena. Children under the height restriction of 110cms must be accompanied by an adult on main jumping areas (junior jumping sessions). Patrons have a duty to avoid landing on their head or neck. Serious injury, paralysis, or death, can occur even when landing on the trampoline bed, foam pit, air bag or padding. The ATPA is a subgroup of AALARA (Australian Amusement Leisure And Recreation Association), the Australian body representing the amusement, leisure and recreation industries. The ATPA was established in October 2013 to ensure there are sufficient safety measures in place to protect all guests. 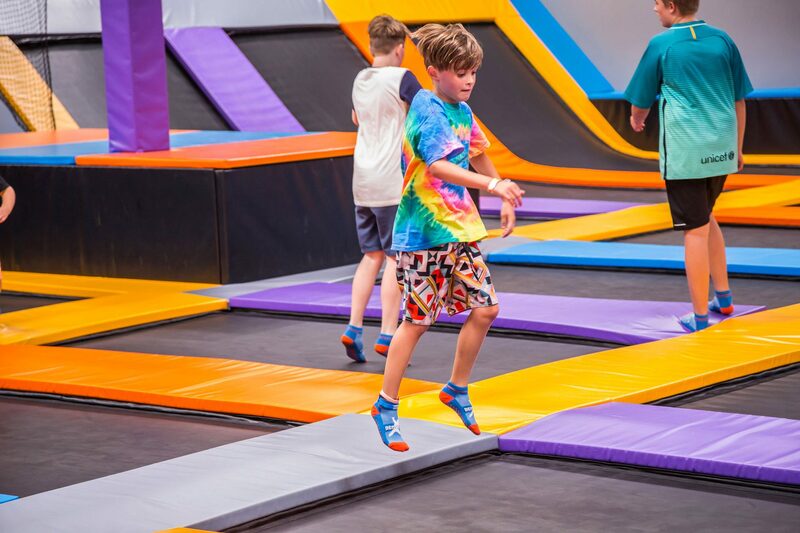 As an industry organisation, the ATPA sets standards for safe operating practices and procedures within trampoline parks nationally. We’ve diligently sourced the best suppliers to help us design and fit out our activities. We work with those suppliers and local installers to meet all ATPA standards for installation and to develop and implement processes and procedures in the park to ensure the ongoing maintenance, compliance, and safety of that equipment. We conduct daily visual inspections on all of our equipment and have a maintenance program for all equipment in the park. We’ve worked with each of our suppliers to ensure all of our staff are properly trained to lead our customers’ safety through their experience. Our staff are trained to be active and alert when on duty in the park. Our staff will be friendly and engaged, but at the same time, are trained to take charge of any situation they need to when a customer’s safe experience is at risk. All of our senior staff are first aid trained, and drilled in dealing with incidents and injuries in the park diligently, timely and as trained. We have a fully equipped first aid room on site if anything should go wrong, and management on duty to work through any issue that arises.